All of our courses are designed with employability in mind. We work closely with industry when designing our curriculum, and our academics use their outstanding contacts to secure guest lectures, work placements and research opportunities with the biggest names in their respective fields. The opportunity to gain relevant work experience while studying is a key part of the educational experience we offer, and part of what makes us – and ultimately you – stand out from the crowd. It’s a philosophy endorsed by Pauline Muir, Course Director for BA (Hons) Arts and Festival Management. 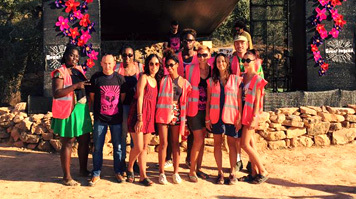 In 2015, Pauline was able to give a group of seven students from the course the work experience opportunity of a lifetime, at the Riba Rocks festival in Barcelona. The electronic music festival is an eco event that takes place in September, and is home to art workshops during the day. The students and Pauline worked on all aspects of the festival, including stewarding, manning the box office and patrolling the campsite. As an off-grid festival, the group also learned about the particular challenges of running such an event, as well as how to deal with unexpected circumstances. “On the first day, despite a forecast of very high temperatures, it rained all day and no vehicles were able to come onto the camp site,” recalls Pauline, “so all activities had to be cancelled.” “It was a challenging experience all round – we worked in six hour shifts and often during antisocial hours. Even when the students were able to get to bed at a sensible time, it wasn’t always easy to get to sleep because of the volume of the music,” Pauline continues. It was a great team building exercise, and the students all saw for themselves the opportunities and challenges of running an eco festival – something that will enhance their CV and help them to show future employers that they have the practical skills needed to support their theoretical understanding of how to manage events and festivals.